Home / health / Never wash Raw Chicken before cooking it…..
Never wash Raw Chicken before cooking it…..
Chicken is consumed by people all over the planet, and many of those people before cooking it, they wash it. They do that in order to eliminate the bacteria that raw chicken has, because the bacteria that raw chicken contains can be harmful to humans. But what if washing your chicken before cooking is actually doing the opposite? – By the Food Standards Agency, washing your chicken can increase the spread of those harmful bacteria rather than eliminating them. This may be nonsense to you, but here is why washing raw chicken might be harmful for your health. America are salmonella and campylobacter . Both of them can be found in raw and uncooked chicken. Salmonella can cause many troubles to humans, and it can even lead to death in some cases. This group of bacteria is commonly found in the intestines of birds. Diarrhea, nausea, vomiting, fever and abdominal cramps are the symptoms. In the United States the leading cause of diarrheal illness is campylobacter. Causing extreme abdominal pain, this illness can even last up to almost two weeks. From exposure to campylobacter long term effects have been reported such as arthritis and development of a rare disease called Guillan-Barre syndrome (40% of Guillan-Barre syndrome cases in the United States are attritubed to exposure to campylobacter). 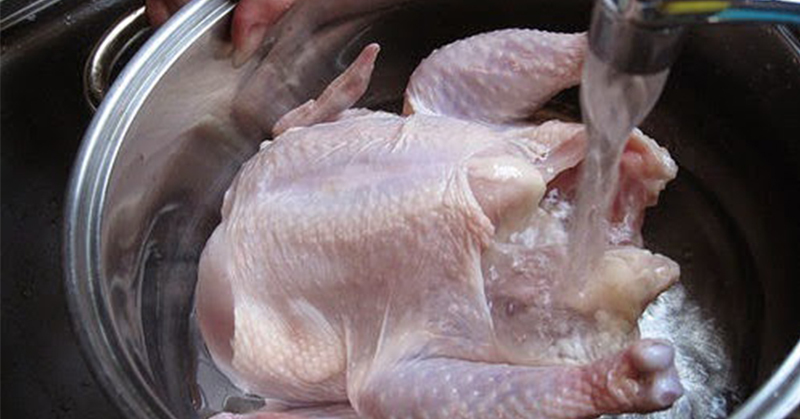 What the Food Standards Agency claims is that campylobacter cannot be eliminated with water, so that means washing uncooked chicken that contains campylobacter will not be eliminated but it will be even worse then, because that way the bacteria will spread through water particles. All you will have to do in order to eliminate all the harmful bacteria in your chicken is you make sure you cooked it well, and before serving it to be steaming hot. You can check also by cutting into the thickest part of the meat and if there is no pink meat and all the juices run clear, your chicken is safe to eat. Remember to never store your chicken at higher temperature than 4 degrees Celsius, because chicken in higher temperature is a magnet for bacteria.